Our refinancing lenders offer low fixed North Carolina mortgage rates to local residents seeking refinance loans that are insured by the FHA. Save money when you lock into a loan today! Nationwide offers home equity, second mortgage and refinancing loans with a fixed or adjustable interest rate. We offer mortgage loans for North Carolina residents seeking cash or simple rate and term refinancing. We offer a wide variety of mortgage refinancing programs for homeowners who need to access money, but prefer not to pay off their existing mortgage in the process. Consolidate debts, and finance home remodeling with cash out refinancing. At this time, FHA loans and equity refinancing are the most popular form of home financing at the moment, and with fixed rates lower than the adjustable rate, it's no wonder why the popularity has increased. Talk to one of our North Carolina lenders today and find out how low your payment can be. * Loan terms are state and federal fee restrictions. Laws may vary per state. In 2013, we finally started to see house values heading the corner in positive territory in states like Virginia, North Carolina and Georgia. North Carolina was one of the East Coast leaders for homeowners that had underwater mortgages but this seems to be changing. More and more appraisers are indicating that many borrowers have seen their negative equity disappear. This opens the door for more opportunities for people to get approved for a low rate North Carolina mortgage refinance. Those that find themselves without enough equity for traditional refinancing will likely seek the HARP 2.0 that is specially designed to help distressed borrowers with underwater mortgages. 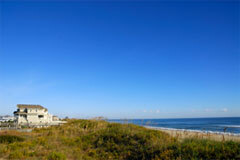 Check with our current pricing and today's rate from our North Carolina mortgage lenders. The North Carolina first time home buyers continue to seek financing from the Federal Housing Administration. The housing sector is rebounding in large part to the flexibility and affordability of FHA home loans. FHA mortgages are government insured loans that are offered up to 97% rate and term or 85% for refinancing terms with cash out. (credit scores are not a factor, but mortgage history is critical). The FHA Secure loan was introduced in 2007 to help troubled borrowers get back on course. Millions of borrowers have had to deal with adjusting mortgage rates and many of them are unable to afford their new variable rate payment. Our North Carolina lenders continue to extend borrowers another chance to refinance into an affordable fixed rate loan. In 2013, Carolina many residents are seeking help to refinance their underwater mortgage. The HARP and FHA streamline have been the most popular solution for borrowers with negative equity. Also see options for FHA Streamline Refinance, Home Affordable Refinance. Whether you are purchasing a home in Raleigh or Durham we offer subordinate loans for purchase or refinance. If you need help with a "Zero Down" 80-20 combo loan, then you have found the right lending source. We offer a wide variety of North Carolina mortgages for first time homebuyers. Our loan team will help you finance new furniture, house improvements and they will show you a solution for consolidating high interest credit card debt. Nationwide offers many fixed rate solutions, that don't require you to refinance your first home loan. We offer competitive 2nd mortgages that will aid you in reducing your monthly expenses while returning you with significant savings. Wouldn't you like to put more money in your pocket each month? Many of our second mortgage and refinance programs were created so people with less than perfect credit, can pay off debts, make improvements to their home, and offer access to additional funds for a multitude of reasons. Before the rates get too high, Apply for a Fixed Rate Home Equity Loan. Stay online and complete one simple form and one of our experienced loan professionals will follow up with you shortly. Don't wait any longer, Call now to speak with a seasoned loan professional live. We offer a helpful consultation that includes a free loan quotes with no obligation. North Carolina mortgage rates are subject to change. This calculator will help borrowers compare North Carolina mortgage loans. Now you can compare the total mortgage interest charges of 4 types of loans.